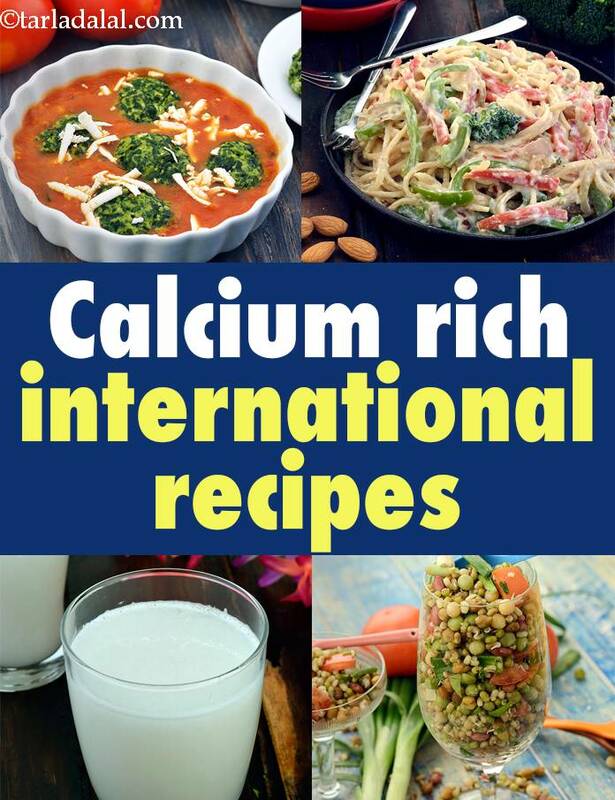 Calcium Rich International Recipes, Veg High Calcium western recipes. Calcium Rich International Recipes. Veg High Calcium western recipes. When you know how to do it, you can adapt any recipe to make it Calcium Rich Recipes! This holds true for not just Indian recipes, but international ones too. This fabulous section offers you endless international recipes, ranging from peppy pastas and perky pizzas to delicious quesadillas, scrumptious pita pockets and crunchy stir-fries. With popular continental recipes and bestsellers from Lebanese, French, Greek and other cuisines, this section is a window into world cuisine, with smart calcium-rich twists. We have a nice collection of healthy salads which are one dish meal themselves. You can choose from vegan healthy lunch salad , mixed sprouts beetroot salad or kale masoor antioxidant salad recipe. Choose from creamy mushroom risotto, cheesy pasta with vegetables or calcium rich creamy herb pasta. Enjoy our collection of Calcium Rich International Recipes. Veg High Calcium western recipes given below from Calcium Rich Breakfast to Desserts. Spinach is good for everyone! these spicy vegetables rolled in spinach leaves provide supplies of vitamin a, which boosts the immune system, improves vision and nourishes the skin of a mom-to-be and her baby as well.